Put the phones down and get ready for some good old fashioned fun. 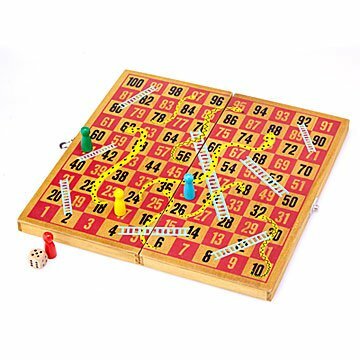 Crafted from wood, this classic board game (like 2nd century India classic) keeps it simple and stylishly nostalgic: avoid the snakes and slide down the ladders toward the finish line. It's foldable, so the pieces stow inside for easy clean-up and toting, whether it's to a weekend at the lake or game night down the street. Made in China. I love the wooden case it comes in as the board and with the ability to store the pieces so they don't get lost !! The kids find the board a little confusing because the numbers go across one way and then back the other so often find them going the wrong way!! But it's a learning experience so all is good.